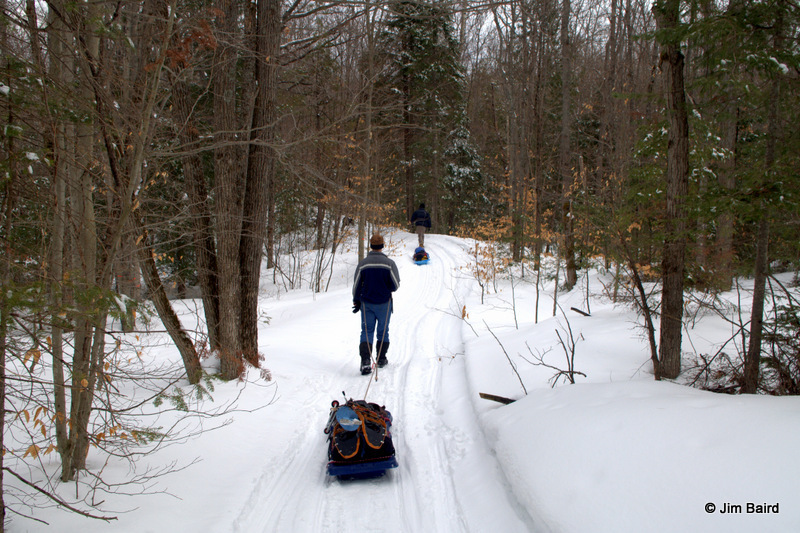 One of the ways I travel in winter is on foot, towing my gear on toboggans—it’s a lot easier than carrying your stuff on your back. Pick one up for $25 from a hardware store and save yourself the headache of all your stuff falling off the sled by doing an easy modification: drill or cut about five holes along each side of your toboggan to run ropes through. I usually just punch square-shaped holes using four stabs with a jackknife. Instead of using one long rope to lash down my gear, it’s best to use two shorter ropes fastened at the middle. This makes it faster to tie your stuff down and to access your gear. Sometimes when you have to bushwhack or travel over a particularly rugged trail, it makes sense to carry your gear on your back. To deal with this I like to secure my backpack to the toboggan, shoulder straps up. This way I can quickly throw the pack on my back with the toboggan attached and then throw it down when I want to start pulling again, no readjusting. When bringing my canvas tent and stove, I’ll throw some gear and food inside the stove and pull it all on another toboggan. I strap a frame pack to this toboggan, which means I can put my gear on the frame pack and carry it on my back if I need to bushwhack on snowshoes. It’s a versatile way to travel in winter if you have some tough traveling to contend with or if you aren’t sure what lies ahead. I use a thicker rope to pull with than the one I lash my stuff down with because it’s easier to grip and it doesn’t dig in. I tie a loop in my tow rope using a bowline and alternate between pulling from my shoulders and waist. I also like it when my dog comes along and helps lighten the load. In this instance, it’s important that a dog has a good harness if he’s going to help out with the work. Some dogs are afraid to pull because they are scared of the sound of the toboggan behind them and they don’t like it when it bumps into their back legs. 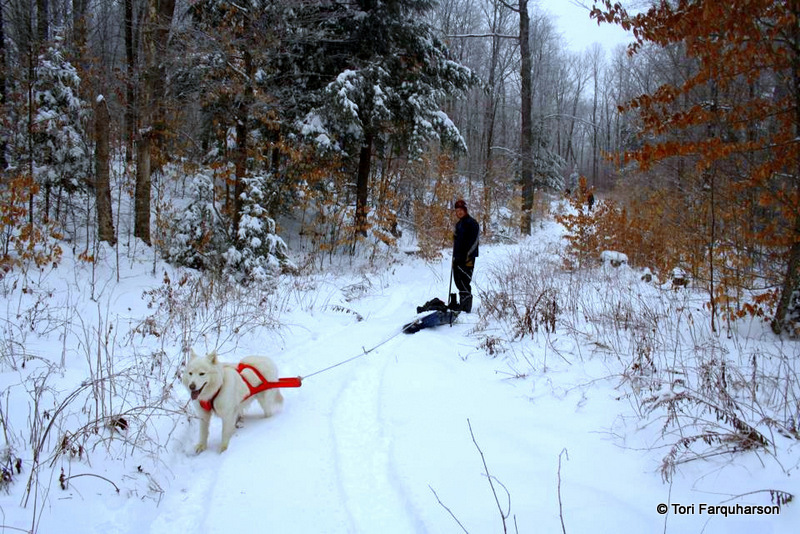 If your dog is a little skittish about pulling, try using a long rope. They usually don’t get spooked if the toboggan is 20 feet behind them. 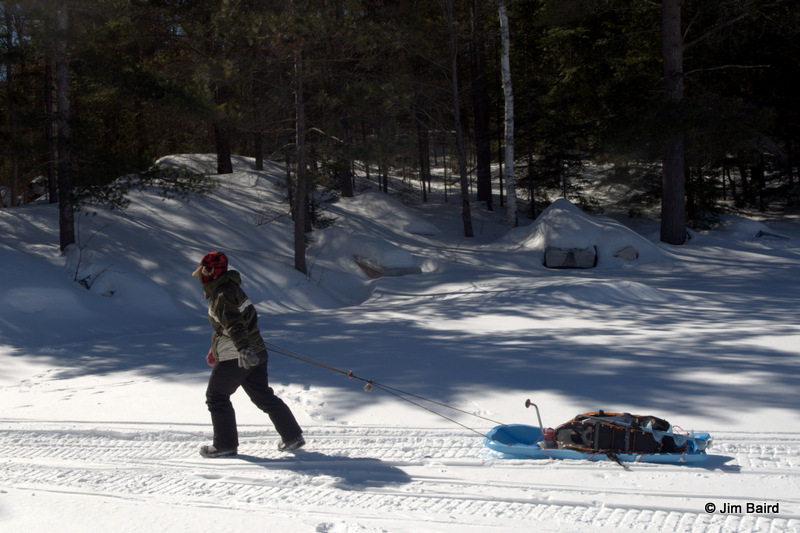 Traveling in slushy conditions on a frozen lake can be very challenging when towing a toboggan. The toboggan will sink through the snow and the slush will stick to it and freeze. It’ll feel like you are towing 1000 pounds when you start moving again as the rough ice on the toboggan digs into the snow. Having a small ice scraper with you can fix this problem; if your stuff is properly lashed down you can flip your toboggan on its side and scrape off the ice. And remember, you can always go tobogganing too!